Recently, interest in the Scandinavian style has gradually begun to weaken. However, this trend has not affected the bathrooms and kitchens - here this style is still in fashion. If the Scandinavian-style bathroom is your old dream, but you don’t know how to make it come true, then we are ready to share some secrets. It does not necessarily follow all our advice at once. To bring a Scandinavian-style particle to the bathroom, you will probably need to put into practice only a few of the ideas presented below. 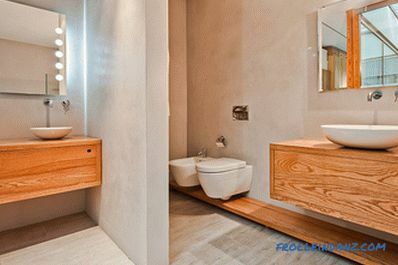 It is quite difficult to make a design project of a bathroom in the Scandinavian style correctly - it is required that it accommodates everything you need, but it remains spacious , that is, it was not only functional, but also seasoned in style. 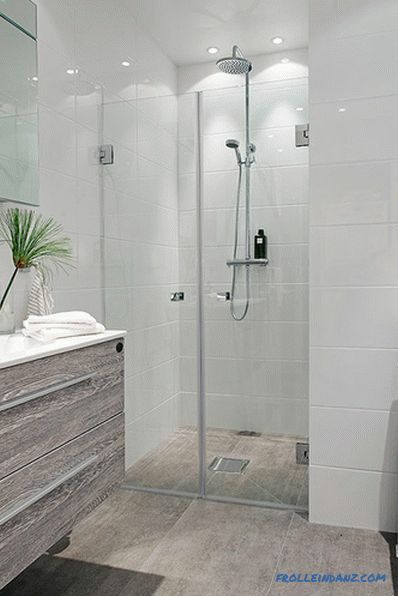 If there are no lovers in the bathroom among your family members, think about replacing it with a compact shower cubicle, and you can put a dressing table or a large closet for storage in the space available. For a large family, the separation of the bathroom will probably be more practical. 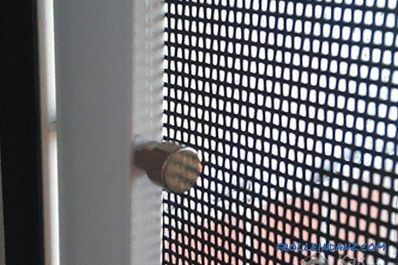 This is not all the "little things" that should be considered at the planning stage. The Scandinavian-style bath by definition must be very light and “airy”. White reigns on white here! 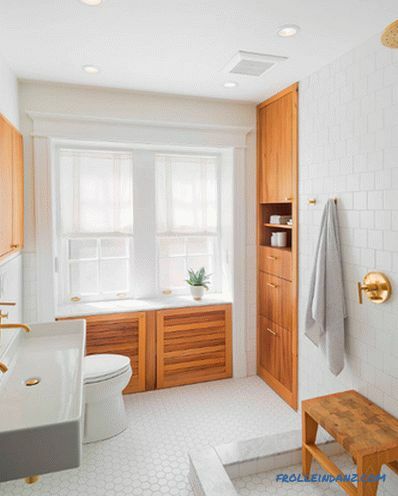 However, dark or metal faucets or pendant lamps here will not look alien - they provide the necessary visual contrast with white plumbing and warm wooden interior elements. In recent years, the prevailing white color characteristic of the Scandinavian style has been gradually replaced by softer pastel and beige shades. If some of them, such as peach, gray or taupe, in tile and wall paint combine with snow-white fixtures and the same wooden furniture, you will succeed in creating a concise look. The use of black and white graphics is a favorite method of Scandinavian-style designers. It looks especially impressive against the background of warmer design elements such as light wood and brass mixers. 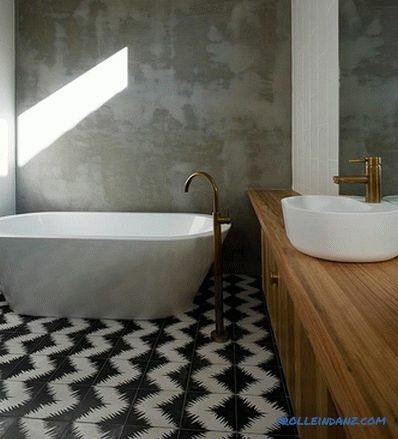 Designers from Auhaus Architecture made a rather bold, but ultimately the right choice of flooring with a black and white geometric pattern, as a result of giving the owners of this modern home in Melbourne a very complex, textured and, most importantly, unique bathroom. Namely interesting finishing materials can make your Scandinavian bathroom unique, individual, different from any other. The wide range of colors and styles of tile makes it the most popular floor and wall covering. Mosaic tiles are often used, as well as natural stone and granite. Just like in the kitchen when making an apron or countertop, the color can revive a bathroom, which otherwise might look a little dull. 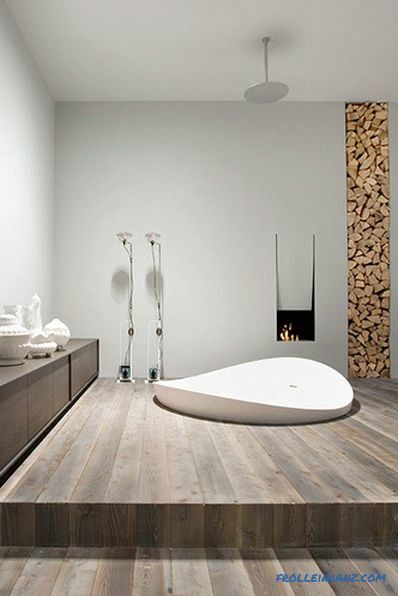 Nothing is more Scandinavian than light wood, so consider the various ways of bringing it to the bathroom. Place a wooden cabinet or bedside table for storing various small things or trim a part of the wall with a tree. And it doesn't matter much whether you select a solid wood, veneer or laminated chipboard. In the luxurious bathroom pictured in the photograph, the wooden hanging dressing table is in harmony with the wooden hanging lamps. 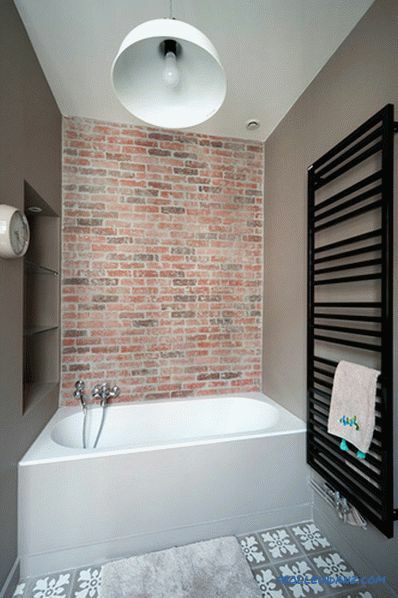 With the help of a brick, you can add a touch of industrial style to the Scandinavian bathroom. This is a great alternative to traditional tile. The multi-colored bricks here create an element of quirkiness and expand the color palette. These warm brown and gray shades can then be repeated on the walls and in the patterned floor tiles. TIP: Remember that bricks used in the "wet zone" require special protection from moisture. Only in this way can he retain his appearance. 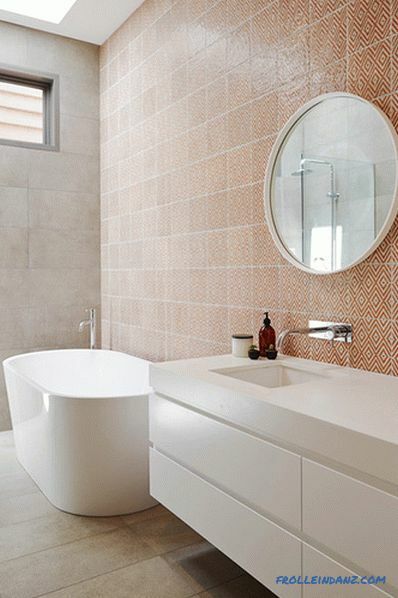 The tricky way to add warm wood shades to the bathroom is to use wood tiles. 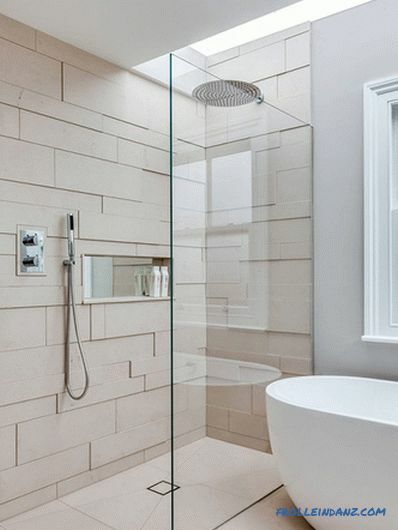 It has all the advantages of tile, but it looks like wooden panels. 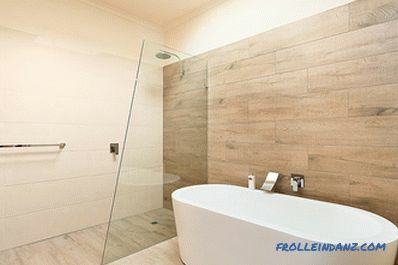 In the example in the photo, a similar wood-like tile was used to cover the floor and the wall behind the bathroom. 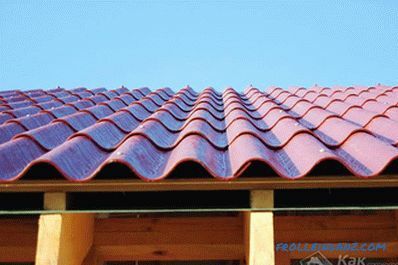 Today, tile production technology is incomparable with what was available a couple of decades ago. Learned to do and texture tile. The number of variations in the color and shape of tiles is huge, but try to opt for any one type, because the Scandinavian style is primarily restraint and moderation. 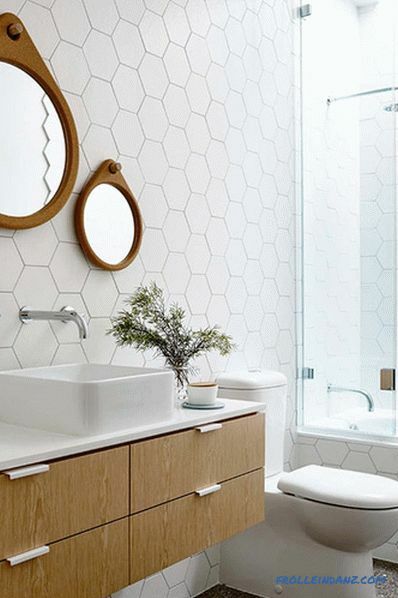 Hexagonal tiles are becoming increasingly popular in modern Scandinavian bathrooms. The wall, decorated with similar hexagons, looks very impressive. An even more striking picture is obtained when a white hexagonal tile is used in combination with black contrasting grout or a smaller tile on the floor is adjacent to it. 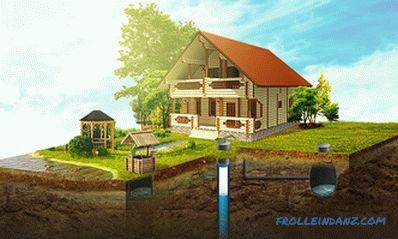 Do not forget about the equipment! A bit of individuality in your bathroom will be added by non-standard ventilation cabinets and grates, shower heads, and faucets. Their diversity in the modern market makes this task quite solvable. 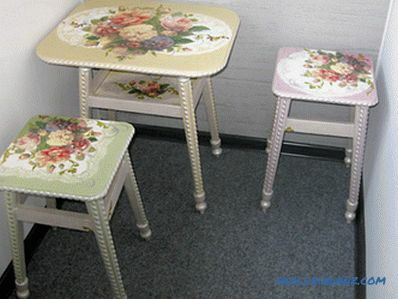 Below are some items of equipment and furniture made in the Scandinavian style. We all love to dive into the bath, but what about diving into a bath that is already immersed in itself? If you have enough space, place the bath in the center of the room and "drown" it in the floor. You take a step down, plunge into the water ... and feel like in your own spa. To enhance the charm of the Scandinavian style, add a small wood stove and a woodpile, then in a large room, even in winter it will be warm and cozy. 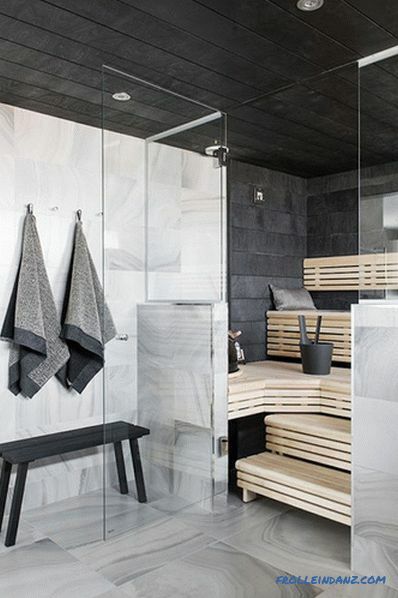 Placing your own sauna in the bathroom is definitely one of the most difficult to implement ideas from here. But it is this that will allow you to feel the spirit of Scandinavia most clearly, and then you will understand that the game is worth the candle. TIP: You need to make the decision to install a sauna at the design stage, as this will require special insulation of the room and fitting necessary communications for ventilation and heating elements. Over time, you may notice that all sorts of things (all of which are very necessary) in your bathroom become more and more, and you are no longer able to deal with a mess. However, chaos and the Scandinavian style are not compatible, so you should think about the organization of storage spaces in advance. An excellent option would be a large or double dressing room. No less effective and hanging cabinets. In small rooms, it is advisable to use built-in structures that add enough space for storing toiletries and at the same time help to save precious space. 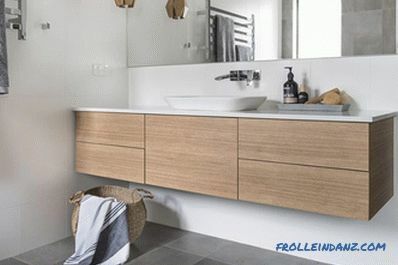 In general, proper organization is the main requirement in the design of compact bathrooms, so it is good if there are a lot of various drawers and trays for storage in the order of various small accessories. Plants, like nothing else, can add color and brightness to a space that otherwise would look quite monochromatic. 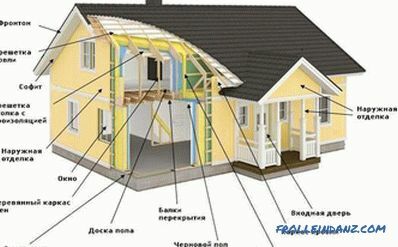 This is especially true for the Scandinavian style. 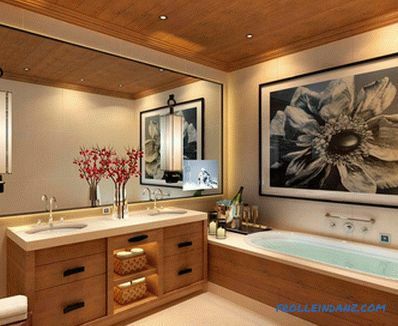 In addition, the presence in the isolated room of something alive seems very attractive and inviting, therefore, probably, the idea of ​​placing indoor plants in bathrooms seems to be quite interesting to many. 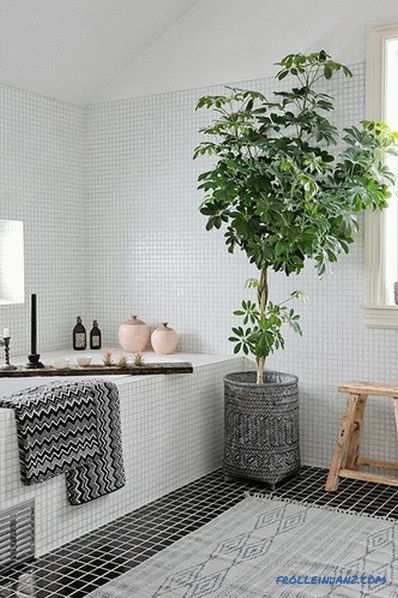 TIP: It is not necessary to drag a huge rubber plant into the bathroom. A small potted plant - a lush fern or a long-blooming violet - located on your dresser, windowsill or shelf will catch your eye (and please them) every time you enter the room. No renovation of the room can be considered complete until the final touches have been added. This also applies to the bathroom. Carefully approach the choice of lamps, soap dispenser, toothbrush holder, dustbin - all these seemingly small things should match each other and the style of the room as a whole. Even an ordinary toilet paper holder can emphasize a given style of space, and can, on the contrary, negate all your efforts. Decor elements should be unique, attracting attention, but it is important that they harmoniously complement the overall picture. If you have such an opportunity, hang a picture or a decorative vase with fresh flowers on a free wall. 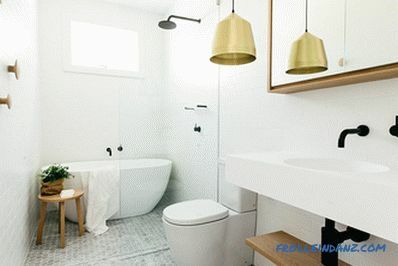 Those who do not want to do a complete renovation of the bathroom, can transform it by changing the color scheme of the room, or at least simply replacing some of the old accessories. Below are the various accessories inherent to the Scandinavian style.